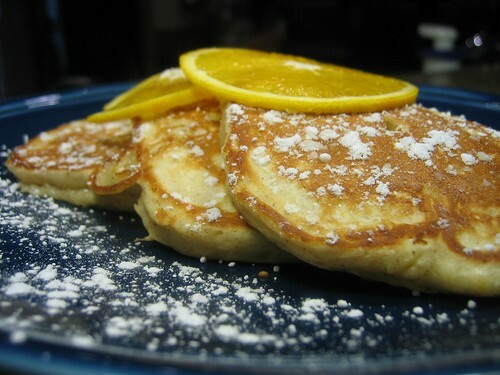 Eat me, I’m pancakes: My husband’s story and his Orange Ricotta Pancakes. Click, click, bloody click, pancakes. (Does anyone else watch The Family Guy?) No? Then the reference is lost on you. My husband makes me pancakes every weekend, and loves The Family Guy. When the tummy starts to rumble, I just have to say that special phrase and he snaps to — griddle on, pancakes working. At heart, I’m probably an egg-breakfast girl. I like salty foods in the morning. Tater tots before cereal. Hard-boiled eggs before pastry. But I love my weekly pancake breakfast. First, because my husband makes some wicked-good pancakes. Second, because it feels like family. My fondest memories of childhood are Saturday mornings, eating pancakes with my mother and brother. It was a time we could share together in our vastly diverging lives. I’m fairly certain my family also feels this pancake affection; in fact, when I was just starting to cook, my brother gave my wife and I an outstanding pancake griddle — which many a pancake has been born on. (It’s the same griddle featured in the shots here.) Since then, I have given both my brother and my mother griddles, too. Pancakes, of course, have a rich tradition beyond my family — and they’re good for much more than carrying maple syrup flavor. They come in myriad designs and are put to various uses, from savory to sweet. 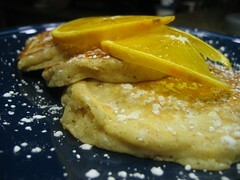 One of my favorite variations is Lemon Ricotta Pancakes, which I increasingly see on brunch menus. Perhaps the best version of these I’ve had are from a well-known restaurant/bakery called Sarabeth’s in NYC. 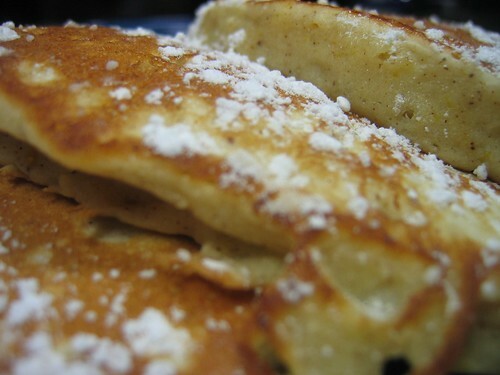 Even after a few months, the pancakes I’d had at Sarabeth’s stuck with me (in a good way). With the turn of fall, I decided to make something more suitable to the season — but using Lemon Ricotta Pancakes as inspiration. I swapped out lemons in favor of oranges, and added classic spices that I feel make cold weather eating so enjoyable — cinnamon, nutmeg and clove. Now let’s talk about method. The muffin method, to be precise. For those who are more experienced cooks, and especially those who are viewers of Food Network’s Good Eats with A-1 celebrity food geek Alton Brown, you likely already know this very simple, but important, technique. The muffin method involves mixing all the “wet” ingredients and all the “dry” ingredients separately, and then bringing them together right before you cook. 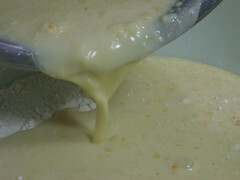 Once the pair are brought together, mix them only briefly; the dry ingredients should be wet and covered, but not make a smooth batter as with cake or brownies. 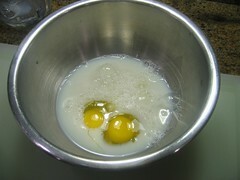 So when you stir them together, leave the lumps in. They are a good thing, and they will cook out. The muffin method’s purpose is two-fold. First, you’re trying to beef up lifting power. You are typically using a chemical leavener such as baking soda or baking powder, both of which start to act once they’re in contact with water. 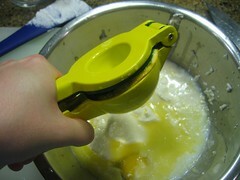 Mixing them with “wet” too soon would cause them to give up some lifting power and result in less rise in the goods. Second, you are trying to limit the formation of gluten. Gluten is a protein formed when water and flour mix, creating an insoluble substance that is highly elastic. Gluten is what gives bread its structure and chewiness — and it’s what you’re looking to form when you knead bread dough. 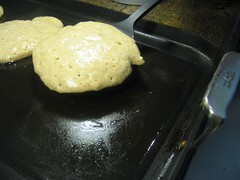 Unlike bread, however, pancakes have a light structure that is not chewy. 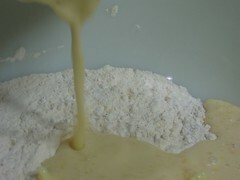 So don’t overstir the pancake batter: It’s the equivalent of kneading bread. 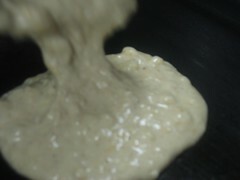 Overstirring will increase the chewiness of the pancake by causing the protein to knot. So, be brief, be quick and leave your pancake batter lumpy. Gluten Free Girl — Not only does she talk about celiac disease, she has great resources and is an excellent writer. 1. 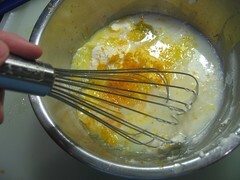 Whisk the wet ingredients together in a small bowl. 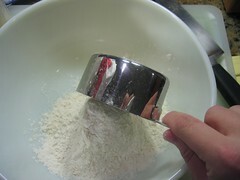 In a large bowl, whisk the dry ingredients together. 2. 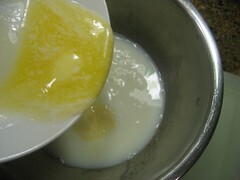 Once they are thoroughly mixed, pour the wet ingredients on top of the dry. 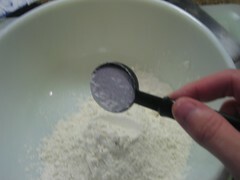 Using a rubber spatula or large spoon, mix until all of the dry stuff is wet and there are no large lumps. Tons of little lumps are great! 3. 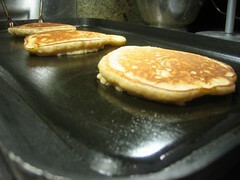 Place a non-stick griddle or large skillet over medium heat. 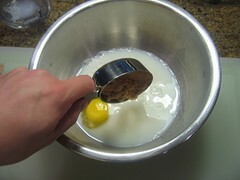 Once hot, pour about a quarter cup of mixture onto the pan. 4. Cook about 4 minutes on one side. This is very tricky because the cook time will vary based on a number of things — but there are two visual cues to look for. First, is the amount of darkness on the side facing down. If it is starting to turn to a dark brown, go ahead and turn it. Second, bubbles on the surface side. If you have the right temperature bubbles will form. 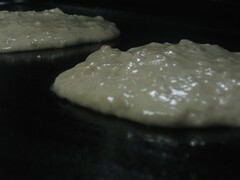 When they begin to set and are slow to disappear, the pancake is ready for turning. They should cook about 75% on the first side. 5. Once flipped, cook them for another minute or until they take on a nice brown glow. They won’t be nearly as pretty as the first side, but you can put that side face down! 6. You can serve them right away, or cover with a towel and place in a warm oven until you are ready to serve. 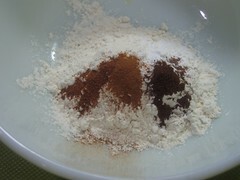 Once ready, coat with powdered sugar and eat with or without syrup of your choice. Enjoy! “Click click bloody click pancakes” indeed! If you make those for me, I’ll love you forever! Not that I don’t love you anyway! But the pancakes would help. I loved these pancakes. Can’t wait to make them myself. You certainly put a fresh spin on a topic that’s been written about for many years. Excellent stuff, just great!